(CNN) -- Attempting to diagnose a nearly mute and temporarily delirious spacecraft more than 100 million miles away, NASA mission controllers said Friday that they suspect a hardware problem on the six-wheeled Mars rover may have caused a severe malfunction. The craft, Spirit, has sent back little more than beeps and sporadic data bursts since Wednesday, forcing NASA engineers to scramble for answers at an inopportune time: an identical robot ship is poised to land on the other side of Mars on Saturday night or Sunday morning. Cautioning that they will need more time to understand what went wrong, project engineers said they have determined that Spirit has rebooted or tried to reboot itself more than 60 times a day since the failure. The preliminary health checkup includes both bad news and good news for the $400 million mission, designed to search for evidence of water on the red planet in the ancient past. First the bad. 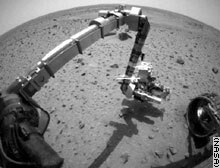 "We will not be restoring functionality to Spirit for some time, for days or weeks, even in the best of circumstances," Pete Thiesinger, Mars rover project manager, told reporters at NASA's Jet Propulsion Laboratory in Pasadena, California. Now the good. NASA engineers think they can maintain the spacecraft's current health for some time, communicating simple commands and receiving simple replies, but nothing comparable to the flood of geological and photographic data from the first 18 days of the mission in Gusev Crater, a roughly 100-mile-wide pockmark thought to have once been filled with water. "I expect we will get functionality back from this rover," Thiesinger added. The chances that it will be perfect again are not good. But the chances that will not regain functionality are low, too, he said. The culprit remains a mystery, but engineers have pinpointed the time when the glitch began. Spirit was using an onboard motor to move its thermal spectrometer for a test when the motor unexpectedly conked out. After that, its messages to Earth became sporadic, feeble and in some cases garbled. More detective work determined that its processor repeatedly wakes up, attempts to load software data, finds a problem and then presses its own reset button. JPL engineers have coaxed Spirit back into regular and coherent contact with Earth, albeit in very simple conversations. They think one possible cause is that a hardware system has broken and affected the software somehow. "We're a long, long way from being done here, but we have serious problems and our ability to work around them is unknown," Thiesinger said. If performing long-distance therapy on Spirit were not enough, NASA must guide an identical twin rover to a landing in Meridiani Planum, a high-elevation plain loaded with a mineral that often forms in the presence of water. The Martian atmosphere is much thinner there than it is where Spirit landed, and a recent dust storm in the region thinned it even further. The conditions mean that Opportunity's parachute will have a harder time slowing the craft as it prepares to land. To compensate, the craft will deploy its parachute much sooner before touchdown, which is scheduled for 12:05 a.m. ET. "This will be challenging because it's the highest-altitude landing that NASA has ever attempted," said Wayne Lee, the engineer in charge of Opportunity's entry, descent and landing.